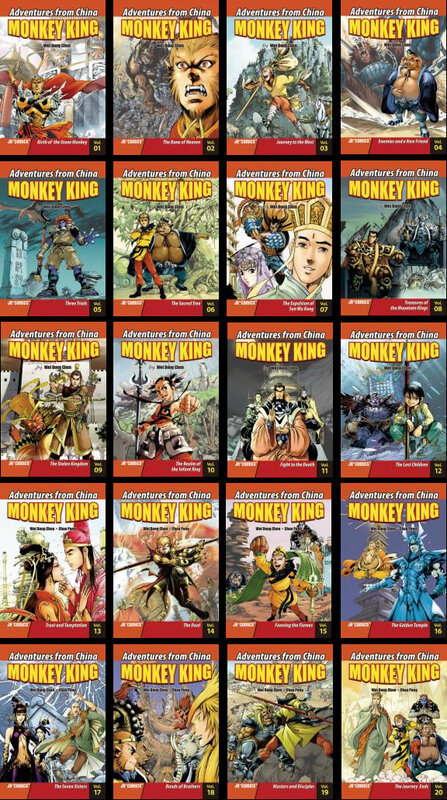 After finishing the 3 kingdoms comics, I proceeded to devour the Monkey King comic series which is published earlier by the same comic publishing company. I'm not too familiar with Journey to the West. Like the Romance of the 3 Kingdoms novel which I have not read, I didn't read Journey to the West as well. My understanding is from the 1st drama series many years ago (ok forgotten enough) & a movie last year starring Donnie Yen as the Monkey King wrecking havoc in heaven & Chow Yun Fat as the jade Emperor. 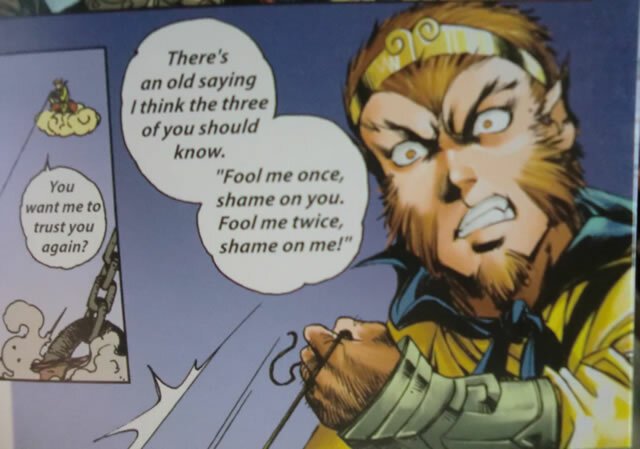 It is harder to borrow this Monkey King comic series from libraries as people find it easier to understand due to fewer characters (5 travelers) & unique demons compared to the hundreds in 3 kingdoms which people tend to avoid. Again I like the themes at the end of each volume which try to extract the lesson.. The Mahayana sutras have been referred to throughout the story as the textual key to mankind's salvation. The sutras of law, discourse & scripture are powerful texts & they will provide humanity with the tools necessary to escape the suffering of the world. But Buddha expresses reservations about the sutras power to change the world right at the moment when one expects the journey's end to be greeted triumphantly. The supreme being believes that humanity has descended so far into a living hell that it will be unable to understand the message of the sutras. Simply providing the answers doesn't mean that people will be able to comprehend them. Reminds me of Warren Buffett's advice:. As simplistic as it is, I didn't understand the concept until recently. A tortoise making slow & steady gains would trounced the many rabbits of the world striving to get rich quick which in the process end up poorer. Losing $$$ is one thing, losing time which the $$$ is earned is another which is irrecoverable. Nevertheless I still have no regrets as earlier setbacks sought to make the learning of Buffett's free advice sink into me. This is why it was essential for Sanzang & his disciples to go through what they did. Over the course of the journey, Sanzang, Sun Wukong, Zhu Bajie & Sha Wujing & Yu Long have each confronted situations that tested their courage, wisdom, empathy & will to succeed. Each of them has had to reconsider everything he thought he knew about himself & the world around him. Each of them has to confront what it means to live in a world meaning meaning or purpose, a world bereft of morality or a sense of justice. As a result of this, the 4 travelers who arrive at the gate of West Heaven are not the same 4 travelers who came together a decade earlier; they are each wiser & better able to understand a scripture that speaks to the need of every individual to be selfless, courageous, patient & intelligent about how to navigate the path to enlightenment. Of course, not every single person in the world could make the journey to the West; but when these 4 friends finish their mission, their experience will help them convey the true meaning of the sutras to those who would have no way of knowing what it took to bring them back to China. This is what I consider the most glaring flaw of the hybrid regime's concocted Group Representation Constituency(GRC) scheme which allows newcomers to be 'parachuted' into parliament by hiding behind a minister. Without going through groundwork with the peasants, we now end up with a bunch of ministers & MPs who have little idea of what the peasants are going through. Better able to understand? Another no. The journey to the West began with a clearly stated objective: to recover the Mahayana Sutras from India & return them to China so that mankind could be saved from madness & suffering. But what is clear by the end of Journey to the West is that recovering the sutras is only part of the journey's larger purpose; in order for the wisdom of the sutras to be understood, 5 unlikely companions had to journey both to the farthest reaches of the world & to the very edge of existence. Their success or failure would determine whether the sutras would ultimately save the world, because understanding the path of enlightenment requires making a remarkable journey. $1000 can buy a flat. A couple both working to pay 30 years housing loan is affordable. US$199.80 for 20 book series. Save $$$ & shelf space by borrowing from library. Ha ha ha. The answer to what puzzled me. How come the Monkey King needed help to defeat certain monsters when he was practically invincible against the heavenly beings, their weapons & magics. All of the monsters encountered by Sanzang & his disciples fit 1 of 2 groups. The 1st group consists of the monsters who originate from the natural world, who evil deeds stem from an animal urge to rule the land & hunt prey. These are the monsters that Sun Wukong can identify when others can't possibly because as the product of the collision between the earth & the heavens, he can sense a natural-born monster, even in disguise. These monsters tend to be weaker. Sometimes Wukong can kill the monster with a single swing of his staff(the White Bone Goblin). Other times, the monsters are destroyed through a battle of wits (Tiger, Sheep & Elk Oracles). In either case, Wukong & his companions are able to defeat the monsters on their own. And since the 'evil' impulses of these monsters have been with them since birth, once the monsters are defeated, the natural forces of evil die with them. The other & far more dangerous group of monsters usually go undetected by Wukong. Once detected by Wukong. they are almost impossible for him to defeat without help. These monsters began their lives in the heavens, usually as servants to one of the major Buddhist deities, & their evil deeds stem from a misplaced sense of ambition; most of these monsters became envious of their masters & decided to escape their servitude & come to earth, where they exercise dominion over people using magic & the threat of violence. The heavenly origins of these monsters make them difficult to fight, since they tend to have weapons infused with heavenly energy- for instance, the Rhino Kings armor makes them impervious to attack from anyone other than the heavenly guardians who are their sworn enemies. Also when these monsters are defeated, they often are not killed; they are subdued by the heavenly beings whom they once served & returned to the heavenly kingdom to atone for their crimes. For these monsters, killing innocent people is not a crime punishable by death. This complicated sense of justice in turn complicates the standard understanding of evil. When it comes to the monsters of heavenly origin, their evil is not innate; it's an acquired condition. In other words, it is possible for virtuous beings to do evil things. Understanding this is important for Sanzang & his disciples, because to save the world from evil, the 4 chosen travelers will have to know the nature of the evil they are fighting. In the case of the heavenly monsters, evil cannot be met merely with death; it must be met with a knowledge of its origins, which lie outside the life of the monster & will continue to exist even if the monster is destroyed. In these cases, the monster's life can be, & often is spared. Sanzang & his disciples have encountered a wide variety of monsters on their journey to the West, but the nature of the evil they have confronted tends to fall into one of two categories: innate evil & acquired evil. Successful completion will require understanding how a virtuous being doing evil can create an even more dangerous monster. Brief intro of characters at start of each volume. - Oh, don't wet yourselves. - If this mountain is sacred, then a cockroach is a butterfly! - You were the cretin wiping horses' rears before being buried under a mountain! Ha ha ha! - You must be the buffoon. - Hey! Slum dog! Rise & shine! - If that's a human being, then i'm the Goddess of Mercy! She's a monster! - Where is that miserable fleabag?